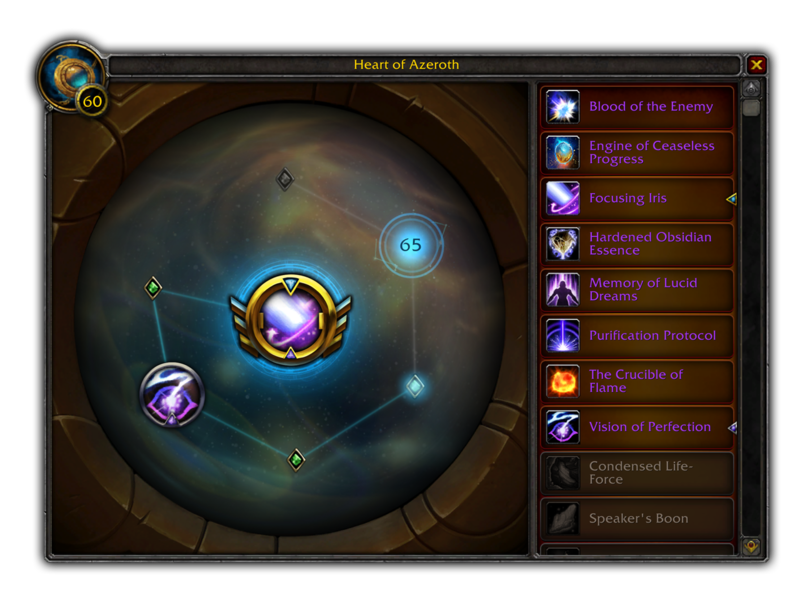 Heart of Azeroth is going to be updated with a new Essence system, allowing you to unlock combat-related powers (an active ability and passives). Here's the official blog post explaining changes coming to the legendary neckpiece. Blizzard today unveiled improvements coming to the Heart of Azeroth system in Rise of Azshara and you can find a recap here. Magni and MOTHER are going to rebuild the Chamber of Heart in Patch 8.2, because Titanic Essences begin to coalesce everywhere in Azeroth. You, as a player, will begin collecting these Essences and unlock new powerful customization options for your Heart of Azeroth. The Heart Forge will be usable right after you unlock your base in Nazjatar. Essences can be used at the Heart Forge to unlock various abilities and function pretty much like talents. There's a new interface which allows you to swap out the abilities/passives. Each essence has a Major slot component (active ability) and a passive one. The Major slot opens right after you complete Magni's questline in Patch 8.2. The two Minor slots will open at Heart of Azeroth level 55, and 65 respectively. Essences can be obtained through world quests, PvP, and raids. Essences will have four ranks. Rank 1 provides an ability based on your role (tank, damage dealer, healer). Rank 2 & 3 enhance your Essence's Major & Minor effects (e.g. more charges). Rank 4 adds a flashy visual to the spell that will make you stand out. The new system will restrict characters from collecting Essences meant for roles their Class cannot fill, meaning a Death Knight can't collect a healer Essence, but a Paladin will be able to collect all three. The new system looks really promising and we can't wait to test it out on PTR starting next week! We'll be posting all unlockable Essences and spells soon. Until then, tell us what you think about the system and partial return of Legion Artifacts! It's already an absolute nightmare of complete boredom on alts and I honestly just gave up. My main and alts are all low 40s and I just don't care anymore. Azerite Knowledge is there to help you with it. The amount of Artifact Power needed to reach a certain HoA level decreases each week. By the time Patch 8.2 is live, I think you will be able to quickly farm the rank required to unlock the first major slot. this is weak af . other stuff from 8.2 looks good but this is just as bad as azertite super unfun makes the neck even shittier . gg 8.3 q and a ion says " we *filtered* up again lol"
Still, it's going to take a while for people who stopped doing WQs, or might rarely do one emissary once. After so many months, it's just boring. Nothing interesting about this new system, quite similar to Legion artifacts, giving extra ability and some passives. Nothing interesting about this new system, quite similar to Legion artifacts, giving extra ability and s﻿ome passives. I'm personally fine with that. For me, the AP system has always been nothing more than a nice bonus on top of whatever I've been doing. It's never been anything I actively persued. As long as they don't repeat the same mistake of making a certain amount of unreasonable grind necessary to not feel scuffed, it's fine. care to elaborate? also kudos for somehow getting around the word filter. 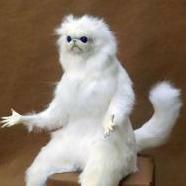 I don't like the possibility that when I change from DPS to Tank I'm going to have to sit in a rested zone and switch traits on the damn HoA not to mention grind another lengthy ways to 65 on 1 character. Where as in Legion when I wanted to switch I auto equipped the Tanking Glaives with traits already auto selected and go on my merry way. Its ok. Just use a tome. I think youre also forgetting about the fact that in Legion you had to grind that AP for each spec on top of each character. Its ok. Just use a tome. Yeah...inb4 tome prices skyrocket on my server. they seems very very weak and only realy workable in mythic plus were u have tons of adds . don't paint the devil on the wall. wait until we've seen it on the PTR, then we can still complain if things aren't right. I think youre also forgetting about the fact that in Legion you had to grind that AP for each spec on top of each character. some people dont take off the rose-colored glasses even at night. I personally didnt like the legion artifact and so i dont like hoa. I just dont like to have slots "locked" to one item. This whole progression doesnt make it better. I mostly feel forced instead rewarded. I unlock some abilities and so everyone does. It leads blizzard into balancing problems and it seems they try it over and over again. Even without such additional abilities balacing seems challenging. So in summary, it probably will lead to more problems then anything else. But well blizzard, surprise me. I can see that Burning Embrace trait being standard issue for tanks, and healers hating our guts for using it on Grievous week.